Want the workout of your life? Get the pump you need to crush another set, lift heavier and take your workout to a whole new level. This is Insanity! 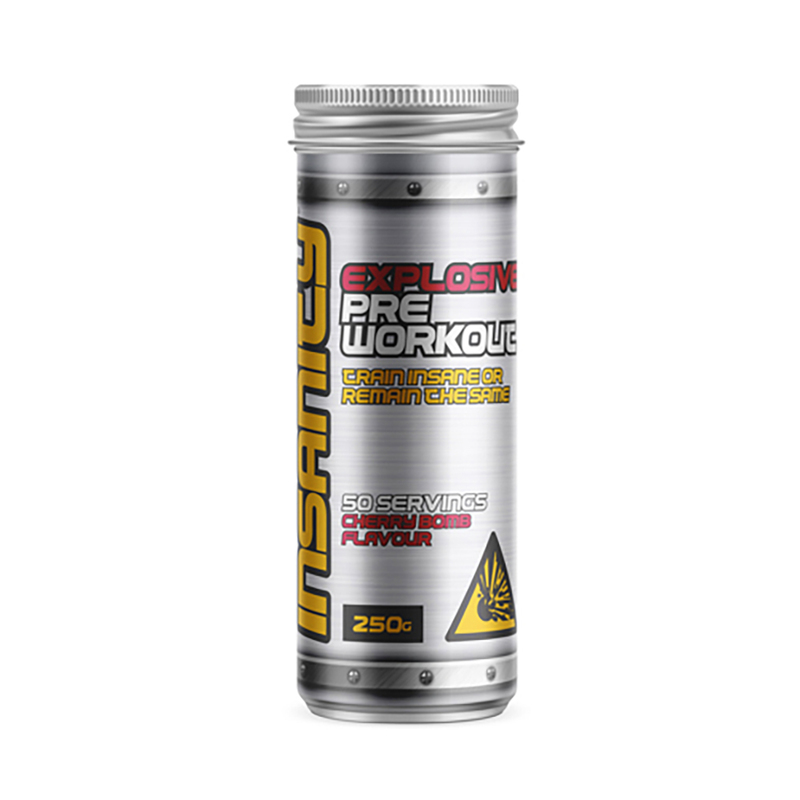 Our explosive pre-workout powder is a combination of creatine monohydrate, arginine AAKG, beta alanine, caffeine, taurine, riboflavin, vitamin B6 and pantothenic acid – all the best ingredients to super-charge your performance. With Insanity coursing through your body, you can push your exercises and yourself harder to achieve bigger gains in the gym. Like it says on the can, you can train insane or stay the same. Take your workout to a new intensity and get the extreme results you crave. Insanity® packs in 10 active ingredients to power you to your ultimate workout, including creatine monohydrate, arginine AAKG, beta alanine, caffeine, taurine, riboflavin, vitamin B6 and pantothenic acid. Just have a look at a few of these performance-enhancing ingredients. Known to boost physical performance, especially in quick, high-intensity exercise. That’s why it’s perfect for helping you push your workouts to the limit. Proven to increase the volume of blood flowing to muscles, AAKG increases oxygen and nutrient delivery, helping your muscles work harder. It also improves the effectiveness of the other ingredients. Backed by multiple research studies, this amino acid can delay the onset of muscle fatigue and help you get more from your workout. Also called vitamin B5, pantothenic acid helps your body turn nutrition into usable energy. It also has a lesser-known benefit — the ability to reduce the buildup of lactic acid during exercise. Every ingredient is included in the optimal milligram dose to enhance your performance. Few other pre-workout powders are this potently dosed, meaning Insanity® can deliver the best workouts of your life. IS INSANITY® RIGHT FOR YOU? If you want to train at the highest intensity to get the most extreme results from your workout, then yes it is. To put it another way, Insanity has been designed to work as hard as you do on your best day. It’s also a delicious way to take in caffeine, key vitamins and minerals just before you hit the gym. We’ve got you covered with a wide range of other pre-workout products: Creatine Plus®, Creatine Boost®, Essential Sports Fuel®, Active Man® Energy Charge, Thermogen® and BCAA Powder. At Bio-Synergy, we’re obsessed with sourcing and using the very best quality ingredients. In the state of the art facility right here in the UK, we combine our 10 super-charged ingredients, each at the precise milligram dose to create our explosive pre-workout powder. Dextrose, Creatine Monohydrate, Arginine Alpha Keto Glutarate, Beta Alanine, Taurine, Flavouring, Acidity Regulator (Citric Acid), Caffeine, Sweetener (Sucralose), Natural Colour (Anthocyanin), Calcium Pantothenate (Vitamin B5), Pyridoxine Hydrochloride (Vitamin B6), Riboflavin (Vitamin B2). For the best results, take one serving 10-15 minutes before your workout. Can be used daily before or as part of any exercise regime. Add one 5g scoop to water or fruit juice for an explosive workout, or go insane and add two. "Pre workout that’s sure to give you the kick you need to give it your all."